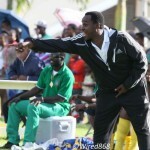 As yesterday’s TTFA FA Trophy quarterfinal fixture at the Guaya Secondary ground headed towards stoppage time, DIRECTV W Connection coach Stuart Charles-Fevrier and his assistants Earl Jean and Trevor Nottingham were on their feet shouting at their players to retreat into a compact defensive block. 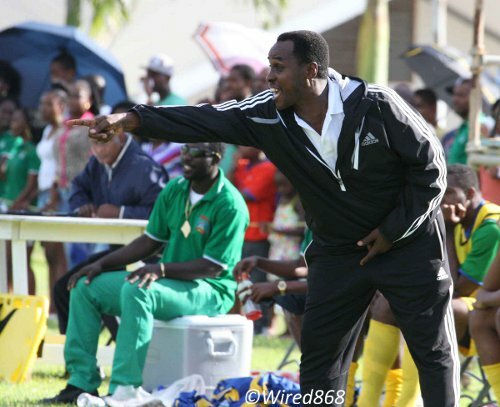 And, as referee Gyasi McDonald’s final shrill of the whistle confirmed Connection’s 1-0 triumph over Guaya United, courtesy of a first half Jem Gordon strike, Fevrier and club owner David John Williams’ satisfied looks spoke volumes. 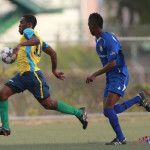 In theory, Pro League rival Central FC should offer a tougher test of Connection’s ambitions in Saturday’s League fixture at the Ato Boldon Stadium in Couva. But Fevrier insisted that yesterday’s triumph over the ambitious Super League team, on a heavy pitch in front of a large, noisy and passionate home crowd, was one of his team’s biggest results this season. Photo: The DIRECTV W Connection club lifted the 2013 Toyota Classic trophy last weekend and is already on the hunt for another crown. Connection displayed the strength that the club has in depth too. 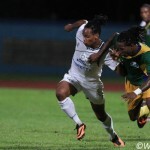 Defender Mekeil Williams, who captained the side yesterday, was the only player who started in Connection’s Toyota Classic final win over Club Sando on the weekend. Fevrier explained that the decision to play his reserve squad, as he has done throughout the FA competition so far, was not a discourtesy to the tournament or yesterday’s opponent. 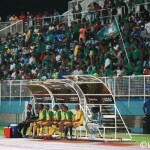 At the other end, Guaya coach Ron La Forest was satisfied too as the “Green Army” narrowed the gap after a 3-0 loss to Connection in the Toyota Classic semifinal; and despite being without the injured pair of playmaker and captain Ryan “Fry” Stewart and free scoring winger Kevin Jagdeosingh. 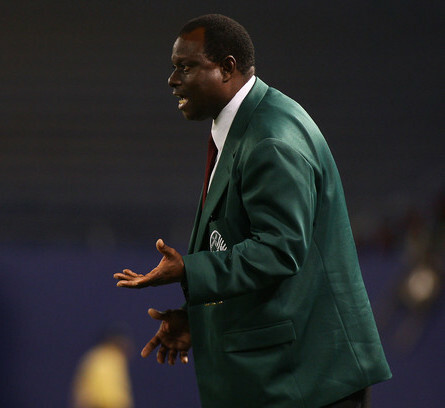 Photo: Guaya coach Ron La Forest. Secretly, Guaya’s considerable support-base might have enjoyed giving Connection a torrid time too. The verbal jousting was as entertaining as the game was dogged. 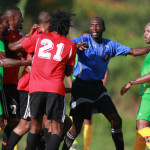 Connection assistant coach Earl Jean got an earful when he complained about the referee’s failure to get out the way of a clearance. 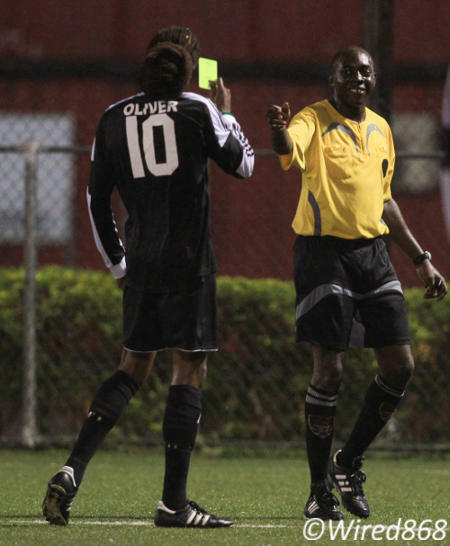 Photo: Referee Gyasi McDonald (right) shares a light moment with Central FC midfielder Marvin Oliver. McDonald had nothing out of the ordinary to deal with in Guaya yesterday. 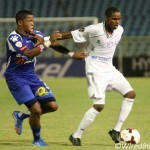 And Connection’s baby-faced Colombian attacker Yhon Reyes got his share too. Let us just say that some Guaya residents wanted to know if the Pro League team had brought Reyes to Trinidad for scrupulous endeavours on the field or mischief after hours. There were compliments for Guaya’s visitors as well; but those were shared in whispers. And there were excited, hushed exchanges as Connection star Joevin Jones entered the field in the 67th minute. It was his last competitive appearance before he heads to Italy on Saturday for a trial with Serie A club Udinese. “That’s the man who scored the solo (against Guaya) in the stadium?” asked one fan. Jones might have scored with his first touch but failed to get on the end of a low, raking Gordon cross. Otherwise, the slender playmaker was useful without being spectacular. It was a game for application not art. 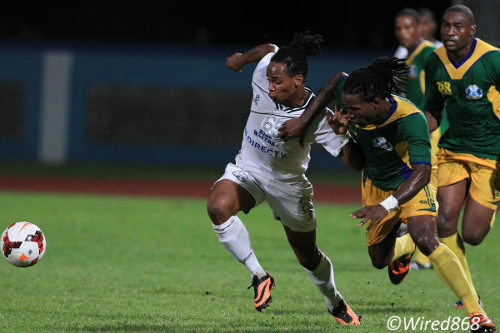 Photo: Dread battle between Guaya United defender Leroy Jones (right) and W Connection attacker Neil Benjamin during their Toyota Classic clash. And, for once, Guaya’s effort was matched by visitors to its home ground. 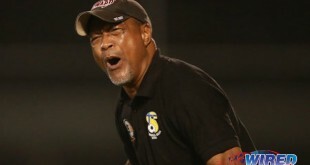 The perspiration and sacrifice of tireless right back Leroy Jones, perceptive stopper Sherlon Campbell and tidy winger Jody Allsop was reciprocated by the likes of Connection right back Alvin Jones—the younger brother of the Italy-bound “Soca Warrior”—and midfielders Tremain Paul and Jomal Williams. But, when it mattered, Guaya could not match Connection’s quality. In the 22nd minute, Gordon sailed up the left flank, worked a wall pass with Brazilian midfielder Celio Da Silva and beat Guaya goalkeeper Kevon Saunders with a fine strike at his near post. Paul and star striker Carlon Hughes could produce nothing to match for Guaya on the day. And, despite several speculative crosses and periods of positive ball possession, the closest the hosts came was an Allsop free kick that beat Connection custodian Aquelius Sylvester but rebounded off the bar. Photo: DIRECTV W Connection coach Stuart Charles-Fevrier. Williams, the club owner, mused over the $50,000 first prize at stake for the FA winners. In Connection’s present mood, it will not be easy to take a trophy off them. W Connection (4-2-1-3): 22.Aquelius Sylvester (GK); 39.Alvin Jones, 25.Christian Viveros, 15.Mekeil Williams (captain), 13.Devaughn Elliot; 6.Celio Da Silva, 11.Tremain Paul; 40.Jomal Williams; 12.Camilo Ortega (10.Joevin Jones 67), 28.Yhon Reyes (3.Gerard Williams 77), 29.Jem Gordon (14.Hashim Arcia 71). Unused substitutes: 18.Julani Archibald (GK), 2.Kurt Frederick, 9.Andell Noray, 19.Leslie Russell. 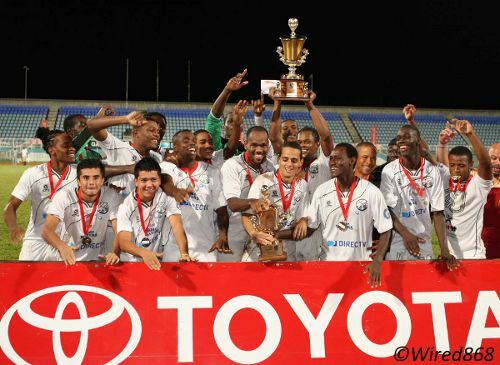 Guaya United (5-4-1): 1.Kevon Saunders (GK); 77.Leroy Jones, 12.Akieno Morgan (2.Marcus Ramkhelawan 70), 14.Sherlon Campbell, 19.Beville Joseph, 5.John Stewart; 27.Kheelon Mitchell (99.Russell Alfred 68), 8.Kerdell Alfred (9.Earlon Thomas 66), 18.Leston Paul (captain), 7.Jody Allsop; 10.Carlon Hughes. Unused substitutes: 80.Marius Des-Cartes (GK), 6.Zavion Navarro, 26.Kendes Garcia, 70.Kheelon Ferrier.